Nobody said smoking pot had to be a total hippie fest -- Easy Times matches its modern-Arabian-style lounge look with loud dance music for a Miami Beach vibe without all that pesky sunshine. Yes, board games. You’d be surprised how many coffee shops have these bad boys tucked away, but the two-story La Tertulia places them right out on the tables and offers the perfect atmosphere to get down and dicey on a rainy day. 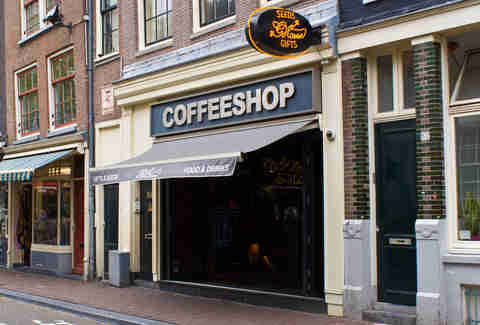 Prix d’Ami is the largest coffee shop in Amsterdam, and thus the world. 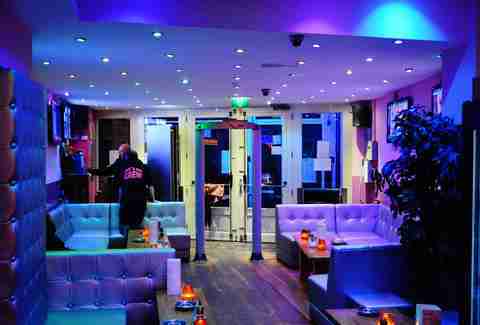 Half of the top floor is dedicated to pool tables, while the other half is a 3D-movie lounge. First prize in this hotly contested category goes to the Green House Lounge (the chain’s Haarlemmerstraat location) thanks to their see-through floor in front of the dealer counter, with big koi swimming underneath. 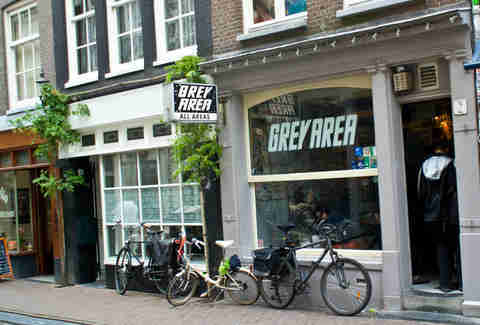 Grey Area is the city’s smallest weed shop, and it’s also known as “The American coffeeshop” because it was started by two State-siders, and’s the only place in the city you can buy weed by the eighth. (Everywhere else sells only by the gram.) Plus there’s a clock where every hour of the day is labeled “4:20”. Willie Nelson and a slew of other stoner celebs are fans, and (bonus!) the best cheese shop in the city hands out free samples all day right next door, which is unfairly good marketing. 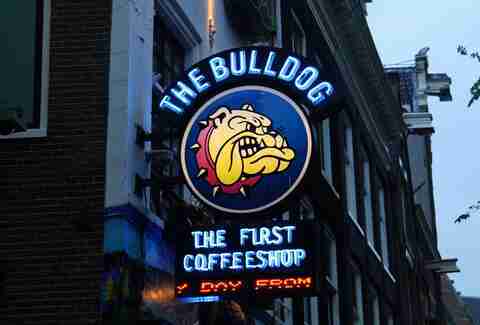 The Bulldog coffee shop in the Red Light District claims on its sign to be the oldest, but everyone pretty much agrees it’s not. (Plus, it’s super-touristy.) 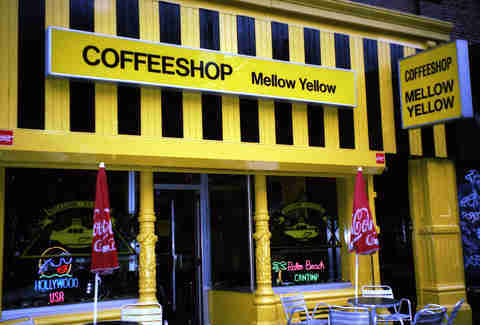 Most say the real oldest was Mellow Yellow, but others argue it was De Tweede Kamer (named after the Dutch parliament) or Rusland (“Russia”). You should probably just try them all to be safe*. 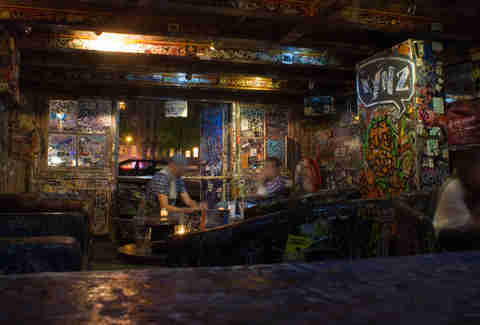 First it may not quite be, but the owner of The Bulldog did go to jail a whole lotta times so you wouldn’t have to. 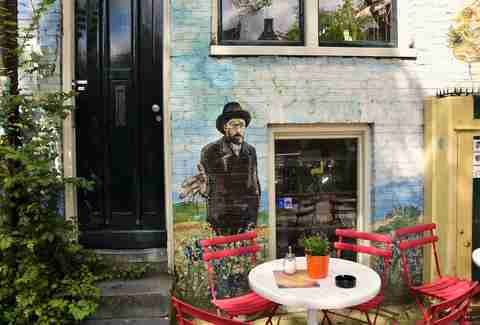 Later, he bought the police station where he was usually kept and turned it into the giant Bulldog Palace on Leidseplein. The side of the building still says “Politie” and there’s a sign at the dealer counter downstairs: “Officer on duty”. Did you know Tarantino wrote most of Pulp Fiction in the Betty Boop coffee shop? Well, now you do. You’d think that’d make it a landmark, right? Nope. This shop is on the chopping block for July thanks to new rules about being too close to schools. Their plan? To buy out the school near them (with 12 other shops). Good luck, guys. 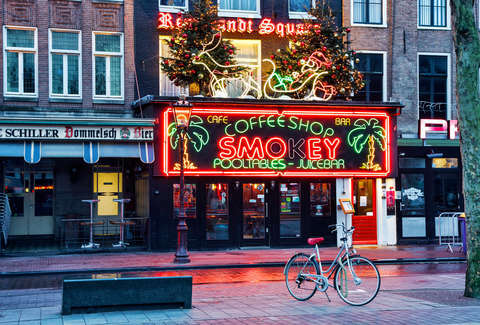 More movie stars who love Amsterdam: this lady-lovin’ duo cliched De Dampkring's popularity as one of the best in town when they chose it for a scene in Ocean’s Twelve. Don’t know what scene I’m talking about? The shop usually plays it on repeat. 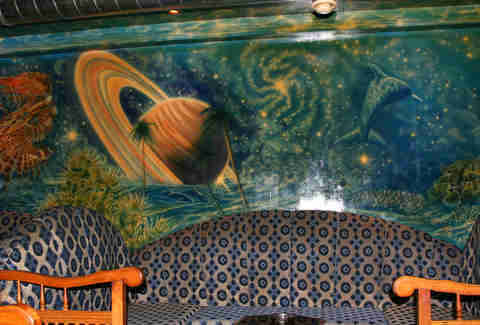 The basement of The Dolphins is painted like you’re sitting at the bottom of the sea. Stoner paradise. 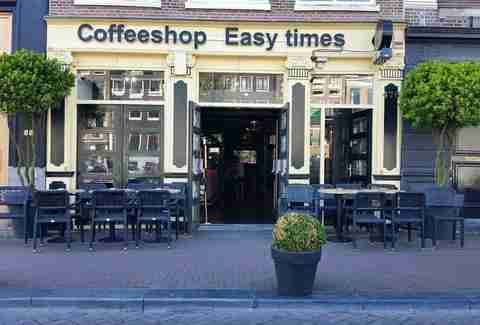 Just about every coffee shop sells chocolate spacecakes (Dutch “special brownies”), but the frosted banana variety from Hill Street Blues is way better. 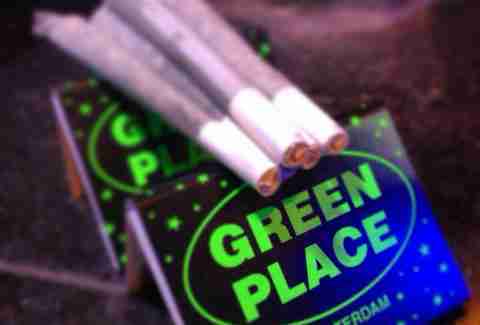 Amsterdam’s full of winners, in Cannabis Cup terms, but the current holder of the crown is The Green Place for its Rollex OG Kush. 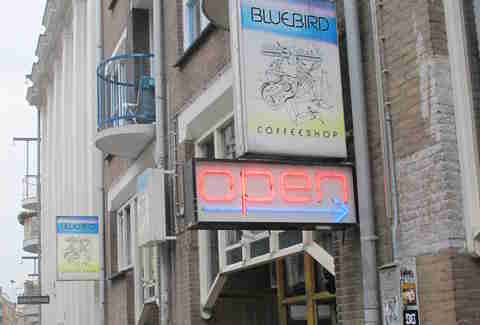 Bluebird sells bags at fixed price points: €7.50, €12.50, and €40 mostly. Then they stuff the bags fuller than most shops would. 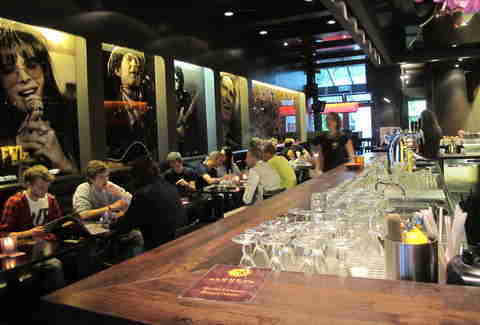 Plus, the staff speaks a ton of languages, so you can zone out listening to them in tranquility.